Much of the rock underlying Humboldt County was laid down 100-150 million years ago during the Jurassic and Cretaceous periods. At that time, while dinosaurs roamed elsewhere, our area was on the ocean bottom. Since then, earthquakes and geologic uplifts produced a series of northwest running mountain ridges. Rivers then found the easiest routes between those ridges. Three moving plates of the Earth's surface meet here, making northwest California the most seismically active area in the nation. Earthquakes, usually small, occur frequently and at times are followed by tsunamis. The land continues to rise at about one tenth of an inch per year. A walk along today's shoreline, often shows remains of earlier beaches high on the cliffs above. 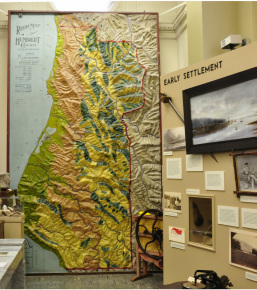 Image: This relief map of Humboldt County was constructed of toughened papier-mâché​ by Eureka engineer J. N. Lentell. It was made for the Humboldt exhibit at the 1915 Panama Pacific Exposition in San Francisco.